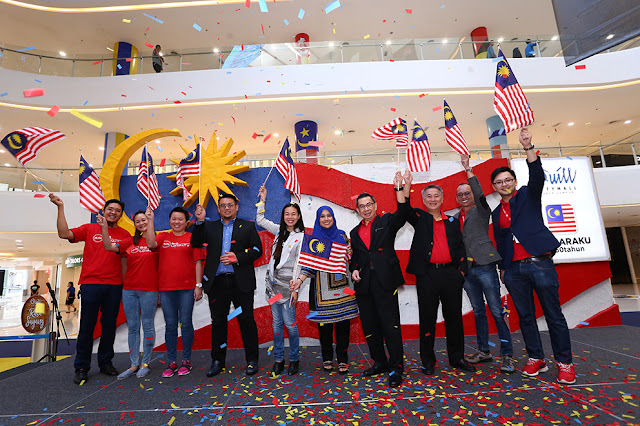 Quill City Mall KL, in partnership with Kakiseni, celebrated 60 years of Malaysia with delicious food, interactive exhibitions and performances for its ‘Rasa Sayang’ Merdeka celebrations on 26 August 2017. Sourced from every corner of Malaysia and served at Quill City Mall KL - sample deliciousness at pop-up stalls (warungs) while exploring interactive exhibitions and taking part in food competitions and celebrate Hari Kebangsaan Malaysia 2017! 60 types of Malaysian food, LIVE viewing event and Niki Cheong Exhibition were among the happenings lined-up. A host of events and activities were featured, the Rasa Sayang experience came in three unique ‘flavours’ for visitors to enjoy, including #makanankita, #sejarahkita and #tempatkita. The ‘Rasa Sayang’ Merdeka celebrations event was officiated by YB Datuk Mas Ermieyati binti Samsudin, Deputy Minister of Tourism & Culture of Malaysia, Dato’ Ar. Michael Ong, Group Executive Director of Quill Group of Companies, Victor Kaw, Chief Commercial Officer of AirAsia BIG Loyalty, Kathleen Leong, Head of Commercial for Malaysia and Singapore of AirAsia BIG Loyalty, Miss Low Ngai Yuen, President of Kakiseni, Ng Chee Kheong, COO of Quill Group of Companies, Alan Cheong, Centre Manager of Quill City Mall Kuala Lumpur, Joseph Teo, Vice President, Marketing of Quill City Mall Kuala Lumpur and celebrity chefs. There is no truer adage to describe Malaysians than the one about being what you eat and as the centrepiece of the Rasa Sayang experience, #makanankita celebrates our food for the way it can unite Malaysians of every stripe. Shoppers and visitors were surely exposed to the wide variety of 60 food here in Quill City Mall KL. Food curators Priya Prabakaran and Edea Nor scoured the country in search of the best, the most authentic or the most unique food and flavours and brought them together under one roof. At pop-up warungs with hip designs around the mall, old school hawkers and cooks serve up a dizzying array of Malaysian cuisine including Kelantanese food, Sarawak laksa, halal dim sum, pasembur and a mouthwatering selection of kuih. And if you have a sweet tooth, you will be pleasantly surprised by the unique desserts with fanciful names you can find here like air jagung heaven, gelato durian D24 and onde-onde cupcakes. Interesting redemptions are in-store for all shoppers; every shopper can enjoy a can of Oishi or 100PLUS for FREE with a minimum purchase of RM10 from any vendor at #WarungKita. Those who fancy themselves masters of the kitchen tested their mettle and won fabulous prizes in a food contest like ‘Cook for Malaysia’. 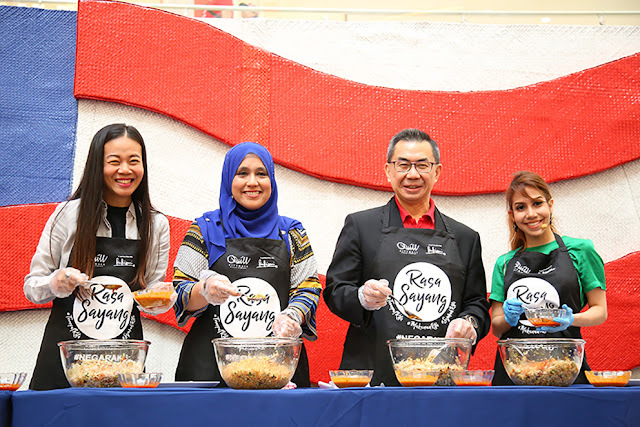 Speed, skill and ability are the name of the game for ‘Cook for Malaysia’ as contestants in teams of two worked together to beat the clock and the competition in a display of kitchen prowess to win up to RM8,000 in shopping vouchers. For details on how to enter the ‘Cook for Malaysia’ challenge, contact us at chefmakanankita@kakiseni.com before 4 September 2017. Rasa Sayang continues with #sejarahkita, a storytelling project by Niki Cheong that includes videos, photos and texts that, altogether make up our nation’s collective history. #Sejarahkita is the continuation of five years of Niki’s storytelling projects organised – in collaboration with Kakiseni - in conjunction with Malaysia Day and Hari Kebangsaan Malaysia. In 2013, Niki’s storytelling team travelled to all 13 states in 15 days, and again in 2015, when a capsule was picked up state by state by a diverse group of Malaysians, who each filled it with soil from their respective states. This year, his project marked #60tahun since Merdeka by re-presenting the many stories he had amassed over the years while showcasing new ones collected this year in video and photo exhibitions that visitors can be a part of by adding their own experiences. Your Rasa Sayang experience at Quill City Mall KL wouldn’t be complete without catching one of the many #tempatkita shows including a monologue session by Asia's Next Top Model Alicia Amin, directed by Nour Amir and produced by Shufitri Shukardi as well as a spoken-word, immersive-theatre experience called 'Malaysia Throws Herself a Birthday Party' presented by spoken-word movement Speak City Asia in collaboration with local theatre company, theatrethreesixty. Repurposing mall shop-lots into pop-up theatres, #tempatkita is a unique experiment that seeks to make space for local indie theatre groups and bring more arts to the masses. These shows are curated by Shufitri Shukardi from Kakiseni and are proof that art can take place anywhere artists and audiences meet in an exchange of creativity and ideas. We are delighted to announce the partnership with AirAsia BIG Loyalty and Quill City Mall KL together with Quill Automobiles under Quill Group of Companies. As part of our customer loyalty programme to reward our shoppers, AirAsia BIG Loyalty together with Quill City Mall KL are giving away BIG Points, which can be accumulated to redeem AirAsia flights from as low as 500 BIG Points during the monthly member’s only Final Call Sale! The partnership with Quill City Mall KL commenced from 26th August 2017 onwards - mall wide, exclusive for Quill City Mall KL shoppers. 2 BIG Points for every RM1 spent on weekdays at Quill City Mall KL. 1 BIG Point for every RM1 spent on weekends at Quill City Mall KL. Download the AirAsia BIG Loyalty mobile app from the App Store or Google Play. Log in to AirAsia BIG Loyalty mobile app with your existing BIG Member ID. Or, register for an AirAsia BIG Loyalty account for free. Snap a picture of the official receipt and submit via the mobile app successfully. Continue your shopping at Quill City Mall KL to earn more BIG Points. Another good news, in conjunction of celebrating Hari Kebangsaan Malaysia 2017, we introduced the BIG Merdeka Giveaway from 26 August to 22 September 2017 where AirAsia BIG Loyalty will reward free round trip flights to Penang, Langkawi, Terengganu, and Sabah to 40 lucky winners! To participate in the giveaway, customers would just need to spend a minimum of RM60 at any shop in Quill City Mall KL in a single receipt. Then, simply snap a photo of the receipt via the AirAsia BIG Loyalty mobile app. TEN (10) winners will be selected on a weekly basis. Terms & Conditions apply. This event is in partnership with Kakiseni, in support of Tourism Malaysia and DBKL together with general sponsors of beverage by 100PLUS Malaysia & Oishi. Rasa Sayang Merdeka Celebration campaign is currently happening in Quill City Mall KL from until 17 September 2017. For more information, visit our Facebook, Instagram: QuillCityMallKualaLumpur or our website http://www.quillcitymall.com.my.